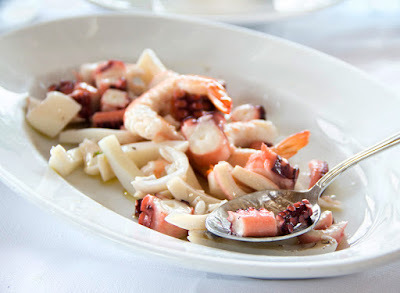 One of my favourite antipasto/ appetizer is Italian Seafood Salad. Sometimes I think the perfect supper would be just 3 or 4 amazing appetizers with a side of wonderful whole whead bread. 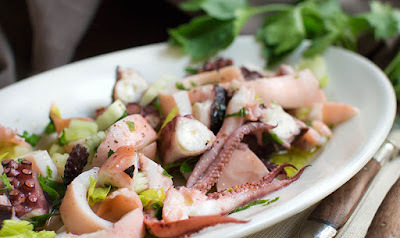 In a large pot of boiling water, boil for approximately 55-60 minutes the calamari, squid. In other pot put octopus, it requires a much longer cooking time, so if you choose to include it, you will need to add an additional hour or so to your preparation time. Remove them and boil mussels and shrimps for about 10 minutes. If you have mussels with shell - bring 1/2 cup of water to a boil in the same saucepan and toss in the mussels. Return to a boil, cover, and steam for 3 to 5 minutes, until they're all opened. (Discard any that remain unopened after 5 minutes.) Remove the mussels from the shells and discard the shells. Drain all ingridients in the medium-sized bowl a second time just to remove excess liquid and let cool. After 30 minutes cut calamari, octopus and squid, put shrimps and mussels. Add chopped celery and parsley , olive oil and lemon juice. Gently mix to combine well. Refrigerate for at least 2-3 hours to let the flavours to mix well. It's very important to have fery fresh ingridients and we never use frozen ingridients for this salad, freezing change the taste, be sure.